Neither we, nor our server provider, may be held responsible or liable in the event of any losses, including data or financial losses, howsoever caused. Whilst your database will be "hosted" on our servers, you shall have no direct/root access to the servers. The only access you will have will be via the supplied web interface(s) as a MIDAS user/administrator to your databases, or via the optional API if applicable. Our servers are located in the United States of America and in the United Kingdom. If you do not wish - or are not permitted by law - to store electronic data in these countries, you should not choose our "cloud hosted" option and instead select a "self hosted" option. The "desired domain" specified at time of purchasing does not guarantee you that domain. We reserve the right to alter or amend the domain at which your MIDAS system will subsequently be hosted if we deem the desired specified domain to be unsuitable for any reason. "Hosting" is only available specifically for our room booking and resource scheduling software, and not for any other purpose, including general web hosting. As such, no other files/webpages can be "hosted" on our servers. We reserve the right to suspend access to your MIDAS system, without prior notice, should we detect, receive reports of, or be concerned about abnormal usage or suspicious activity occurring within your MIDAS system, and/or activity which could degrade or otherwise adversely affect the quality of service we provide to our other "hosted" customers. Your "Annual Hosting + Support" subscription is renewable yearly for the duration of the time we continue to "host" your MIDAS system. Automated renewal reminders will be sent in advance of any such renewal via email to the primary contact we hold on record for your MIDAS system. If you fail to renew your subscription annually, we reserve the right to suspend and/or remove all your databases from our servers. 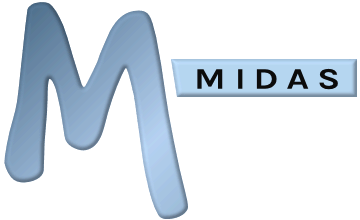 For this reason, it is important that you keep us up-to-date if the primary contact person for your organization's MIDAS system changes. We reserve the right to refuse a refund, either in part or in full, should you cancel or no longer wish to "host" MIDAS on our servers. Our refund policy may be found here. We reserve the right to suspend access to your MIDAS system, without prior notice, in the event of non-payment or disputed payment, relating to your initial purchase, or any subsequent renewals or upgrades. We reserve the right to track page hits and visitors to our servers through server logs or third party Google Analytics tracking code. Any such data collected in this way is not made available to other third parties, and is used purely to allow us to monitor our servers and network in order to improve the service we provide to you. This Agreement is governed by the law of England and Wales, and is subject to the exclusive jurisdiction of the courts of England and Wales. By purchasing a "cloud hosted" edition of our room booking and resource scheduling software, you fully understand and accept these Terms & Conditions. We reserve the right to amend these Terms & Conditions at any time without prior notification. How reliable is the "cloud hosted" edition? Where is my data be stored if I choose a "cloud hosted" edition of MIDAS?